Bradley Central's Hannah Lombard, center, is mobbed by teammates, from top, Jamaryn Blair, Cambree Mayo and Anna Walker after Lombard made the winning 3-pointer in the final seconds of the TSSAA Class AAA girls' basketball state title game Saturday at Middle Tennessee State University's Murphy Center in Murfreesboro. The Bearettes beat Houston 46-44 to win the program's sixth state title and first since 1976. MURFREESBORO, Tenn. — Ending her Bradley Central High School basketball career with a bang, senior Hannah Lombard unleashed pandemonium in Middle Tennessee State University's Murphy Center on Saturday. Lombard calmly nailed the winning 3-point basket with 1.2 seconds left in the TSSAA Class AAA girls' state championship game off a dish from tournament most valuable player Jamaryn Blair. Lombard was bombarded by teammates, who piled on top of her. The premature celebration hurt no one as fellow senior Kaleigh Hughes helped force a five-second call on the ensuing inbounds play to close out a 46-44 victory over Houston High. "For our group to have a banner going up soon that says '2019 state champions' is amazing and surreal," Lombard said. "We finally get to hang another one in our gym. I will always remember this moment. If my children play basketball, I will tell them about how I hit a buzzer-beater to help win state. It will stick with me forever." 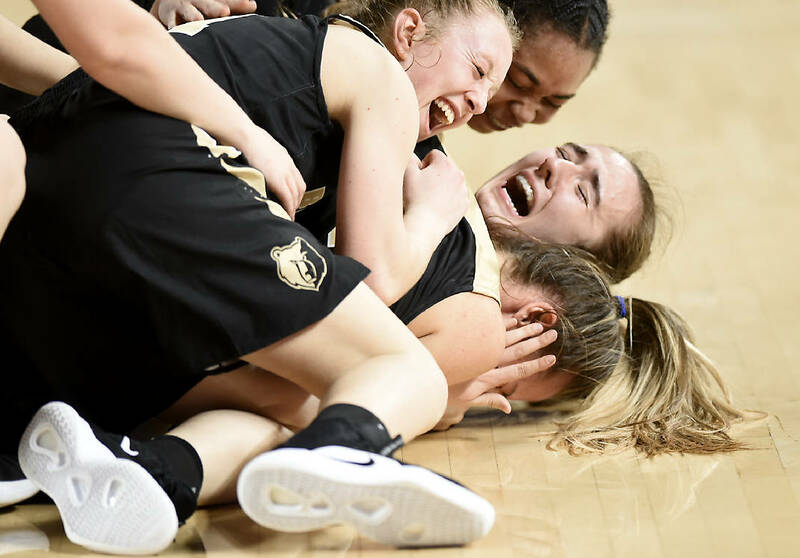 A fairytale ending for the fourth-ranked Bearettes brought the winningest girls' basketball program in the state its sixth state championship but its first since 1976, when Karen Mills hit a deciding buzzer-beater. Bradley is now 6-2 all-time in state finals but before Saturday had not played in one since 1995. "Just one moment in life can change everything," Bearettes coach Jason Reuter said. "The girls are the ones who finally broke the streak. The thing I will always remember about this team is they never flinched when the pressure was on." While being outrebounded 110-76 through the state tournament, Bradley (34-3) held its opposition to 40 points per game and set a state-tournament record with 22 blocked shots. The Bearettes' rim protectors, led by 6-foot-1 junior Anna Walker, were able to turn big stops into points on the other end. Walker totaled 12 blocks and 34 points in the three-game title run. "We hunkered down and played really good defense here," the Samford-committed post player said. "It's crazy to think we are the team to bring it back after all these years. Seeing Hannah make that shot is something I will never forget. I will keep playing that shot in my head over and over." Leading the charge offensively from start to finish yet again, sophomore Blair scored 25 points for a three-day total of 56. The MVP made 17 of 20 free throws as well as the winning pass to the wide-open Lombard, who scored from the top left of the wing opposite the Bearettes' bench. "Last year playing with Rhyne Howard and how she took me under her wing helped me a lot," Blair said in reference to the current Kentucky freshman star. "She helped me to learn how to be calm and stick to the game plan. It's funny — last night I had a dream we won off a buzzer-beater. "I always have loved March Madness. We all stepped up and did what we had to do." Despite being beat 17-3 on the offensive glass, Bradley Central held Houston (31-3) to 33.3 percent shooting from the field. For the second game in a row, the Bearettes topped an opponent with a Miss Basketball finalist. Mississippi State signee Jayla Hemingway finished with 16 points and 11 rebounds but was just 4-of-11 from the field. The Bearettes forced a travel with 11.2 seconds left to set up a final shot at history. Houston was forced into five turnovers in the last 4:46, which began with the Memphis-area team leading 42-37. Houston had only 10 turnovers for the game. "I think these girls can come back next year, too, to state and have a shot to win it all," Lombard said. "I just hope they take this as even if we have a Rhyne Howard or not, we can push through no matter if we are the top dog or underdog. We have that much grit and heart."